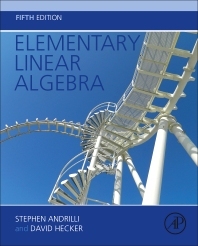 Elementary Linear Algebra, 5th edition, by Stephen Andrilli and David Hecker, is a textbook for a beginning course in linear algebra for sophomore or junior mathematics majors. This text provides a solid introduction to both the computational and theoretical aspects of linear algebra. The textbook covers many important real-world applications of linear algebra, including graph theory, circuit theory, Markov chains, elementary coding theory, least-squares polynomials and least-squares solutions for inconsistent systems, differential equations, computer graphics and quadratic forms. Also, many computational techniques in linear algebra are presented, including iterative methods for solving linear systems, LDU Decomposition, the Power Method for finding eigenvalues, QR Decomposition, and Singular Value Decomposition and its usefulness in digital imaging. The most unique feature of the text is that students are nurtured in the art of creating mathematical proofs using linear algebra as the underlying context. The text contains a large number of worked out examples, as well as more than 970 exercises (with over 2600 total questions) to give students practice in both the computational aspects of the course and in developing their proof-writing abilities. Every section of the text ends with a series of true/false questions carefully designed to test the students’ understanding of the material. In addition, each of the first seven chapters concludes with a thorough set of review exercises and additional true/false questions. Supplements to the text include an Instructor’s Manual with answers to all of the exercises in the text, and a Student Solutions Manual with detailed answers to the starred exercises in the text. Finally, there are seven additional web sections available on the book’s website to instructors who adopt the text. Presents each chapter as a self-contained and thoroughly explained modular unit. Dr. Andrilli has a Ph.D. degree in mathematics from Rutgers University, and is an Associate Professor in the Mathematics and Computer Science Department at La Salle University in Philadelphia, PA, having previously taught at Mount St. Mary’s University in Emmitsburg, MD. He has taught linear algebra to sophomore/junior mathematics, mathematics-education, chemistry, geology, and other science majors for over thirty years. Dr. Andrilli’s other mathematical interests include history of mathematics, college geometry, group theory, and mathematics-education, for which he served as a supervisor of undergraduate and graduate student-teachers for almost two decades. He has pioneered an Honors Course at La Salle based on Douglas Hofstadter’s “Godel, Escher, Bach,” into which he weaves the Alice books by Lewis Carroll. Dr. Andrilli lives in the suburbs of Philadelphia with his wife Ene. He enjoys travel, classical music, classic movies, classic literature, science-fiction, and mysteries. His favorite author is J. R. R. Tolkien. Dr. Hecker has a Ph.D. degree in mathematics from Rutgers University, and is a Professor in the Mathematics Department at Saint Joseph’s University in Philadelphia, PA. He has taught linear algebra to sophomore/junior mathematics and science majors for over three decades. Dr. Hecker has previously served two terms as Chair of his department, and his other mathematical interests include real and complex analysis, and linear algebra. He lives on five acres in the farmlands of New Jersey with his wife Lyn, and is very devoted to his four children. Dr. Hecker enjoys photography, camping and hiking, beekeeping, geocaching, science-fiction, humorous jokes and riddles, and rock and country music. His favorite rock group is the Moody Blues. This textbook is truly phenomenal with the structure of the Odyssey and the poetry of the Bible - the textbook is remarkable.